Our team of engineers, designers and project managers can solve the most complex materials handling conveying, and control requirements, using conventional and automation technology/ a combination of proven as well as latest technologies. We’re a company of inventors and innovators who love starting from scratch to create the best possible system that totally meets your needs, now and into the future. Solutions are designed to a point where all project items, including safety, are local to the project machinery. Each conveyor system we design can be tailored to suit the application it is needed. Decentralised design translates into modules of equipment and/or complete projects being workshop tested with all control elements at the ICA manufacturing site. We design modular systems to allow for upgrades and we are able to be involved on an ongoing basis to ensure your equipment is maintained to optimal efficiency. All ICA solutions are manufactured on site at our manufacturing facility in Bendigo, Central Victoria. On our 15 hectares of land we have a total developed factory complex of over 10,000 square metres across three separate fabrication and assembly buildings. 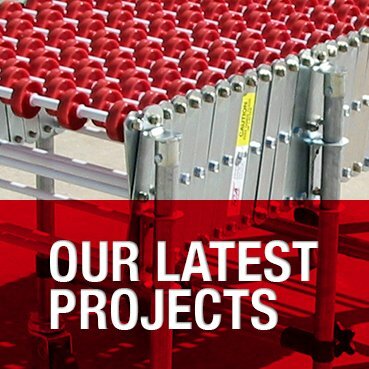 We have the expertise and capacity to manufacture materials handling equipment projects for anywhere in the world. We manufacture and assemble the systems as far as practical for shipping, ensuring the best possible quality offered with minimal assembly / installation time required on site. ICA designs, programs, installs and commissions controls and automation for material handling projects. All effective materials handling systems require control and automation design and processes. We can design and install systems that are purpose built or integrate with other controls and automation systems. ICA’s complete control of supplying for all your project’s needs, reduces installation and commission times, and cost. ICA has the ability to assemble and test equipment in house prior to delivery, this allows for the reduction of time associated when installing and commissioning on site. A crew of experienced and qualified tradespeople are assigned specifically to install your project from start to finish. This ensures efficient and timely installation and commissioning. Training associated with projects varies with the complexity of the project and requirements of the customer. Operator interfaces with equipment are generally kept simple and basic for ease of understanding. Hands on training with equipment and operator focussed training in smaller groups allows for a better understanding of the equipment and it operation. ICA provide custom training in the operation and maintenance of equipment supplied, anywhere in the world. Our training is hands on with small groups. Operation and Maintenance manuals are provided in both hard and soft copy format. During the design process, we give significant consideration to the future maintenance of your equipment. Where possible, basic robust designs are established to reduce maintenance. We design modular systems to allow for easy upgrades and we can be involved on an ongoing basis to ensure your equipment is maintained to operate at its optimum. We warrant all work designed, produced and manufactured for an industry standard period of twelve months.